Our competition entries are closed. Winners will be announced soonest. to experience Thai New Year in Chiang Mai in 2019! • Enjoy a complimentary basil seed infused drink. Congratulations to our 361 voucher winners! Subscribe for notifications about future competitions and get an EXTRA CHANCE TO SPIN! Add me to the list! I want an EXTRA SPIN! The competition commences on the 08th of October 2018 and entries close on the 28th November 2018. 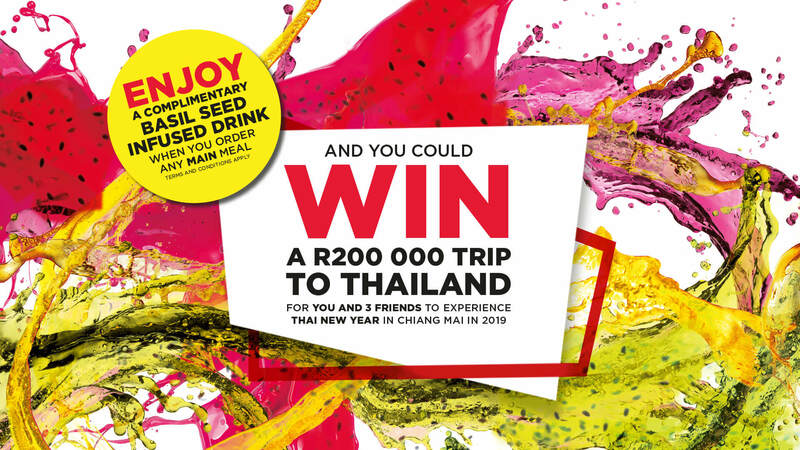 To be eligible to win a R200 000 trip to Thailand for you and three friends to experience Thai New Year in Chiang Mai in 2019 and a night stop over in Singapore, the participant must have purchased a main meal during a single visit during the competition dates and receive a free Basil Seed Drink, at any Simply Asia outlet in South Africa on the specific days (Monday, Tuesday, Wednesday only). The till slip (bill) must be attached to the entry form available in store, which must be placed in the marked entry box in store by the till point provided by Marketing. Customers may enter as many times as they wish as long as they have purchased a main meal from the Thai Specialty and Main with Noodles section in the Simply Asia Thai Menu (Mon – Wed). One till slip is one entry even if there are numerous main dishes on the till slip. The main meals may consist of any one of the following dish numbers with any choice of protein 261, 267, 301, 303, 304, 305, 309, 311, 314, 316, 317, 319, 322, 324, 325, 327, 328, 408, 265, 504, 505, 508, 514, 515, 519, 523, 530, 531, 540, 541, 542, 614, 622 and 625. Offer valid for sit-down and take away orders, excluding all third party delivery services. Simply Asia promotional vouchers may not be used in conjunction with this special unless stated on the voucher. Simply Asia Store specific promotions may not be used in conjunction with this special. Imagine experiencing Thai New 2019 in Chiang Mai with three of your Friends and a night exploring Singapore. Simply Asia and Singapore Airlines will award this prize to one lucky customer in South Africa. By participating in this Promotion, I confirm that I have read, understood and consent to these Terms and Conditions. The opening time and date of the Promotion is 12:00 a.m. on 08 October 2018 and the Promotion will end at 11:59 p.m. on 28 November 2018 (“Promotion Period”). The Promotion is open to individuals who are a legal resident of South Africa, aged 18 years or over, except employees of Simply Asia or Singapore Airlines or affiliated companies. This includes spouses, life partner, parent, child, brother, sister, business partner or associate of any of the persons previously specified. To be eligible to win, the participant must have purchased one main meal on the menu during a single visit to any Simply Asia outlet in South Africa on Monday or Tuesday or Wednesday during the promotion period. The till slip (bill) must be attached to the filled in entry form. The entry form and till slip must be placed in the marked entry box available in-store provided by Simply Asia. One till slip with various main meals is valid for one entry into the competition. An Additional Entry will be supplied to the participants that have filled out an entry card in-store with the valid requirements listed above (In-store) and have gone online to www.singaporeair.com using the promotion code KFSIMPLY and filled out their details on this website. Customers may enter as many times as they wish as long as they have purchased one Main meal. Offer valid for sit-down and take away orders. For the purposes of clarity, if you order 5 main meals on the same till slip (bill), this will count for one entry in-store. No further consideration will be required to receive an entry. Simply Asia and Singapore Airlines shall not be responsible for orders not successfully completed due to a force majeure event or technical fault including, but not limited to, technical malfunction, computer hardware or software failure, satellite, and network or server failure of any kind. At the end of the Promotion Period, one Winner will be chosen at random from the pool of qualifying entries. The Winner will be notified by email addresses and/or telephone number associated with their entry details. If a Winner does not inform Simply Asia in writing of his/her acceptance of the Prize within forty-eight hours of being notified, then the Prize will automatically be forfeited. Another drawing will be held and a Winner randomly selected until the Prize has been accepted. A R200 000 trip to Thailand for you and three friends to experience Thai New Year in Chiang Mai in 2019 and a stop over night in Singapore bought to you by Simply Asia and Singapore Airlines. Simply Asia will award this prize to one lucky customer in South Africa. This customer can then select three friends to join her/him on the trip. Decisions regarding any aspect of the Promotion or Prize are final and binding and no correspondence will be entered into about it. Simply Asia and Singapore Airlines will not be responsible for any typographical or other error in the administration of the Promotion, errors in processing entries, identifying the Prize Winner, in the announcement of the Winner or the delivery of the Prize. Winner and three friends must hold a valid ID and Passport at the time of Prize delivery. The Prize is valid for the Thai New Year in Chiang Mai in Thailand 2019 confirmed travel dates for Songkran – 13 April 2019 to the 15 April 2019. If the Winner is unable to redeem the Prize for any reason, the Prize will be forfeited and the Winner will not be able to redeem any element of the Prize at a later date. Simply Asia and Singapore Airlines will not be responsible or liable to compensate any individual in the event of forfeiture of the Prize. The Prize (or any part of it) is non-exchangeable, non-transferable, cannot be duplicated, is not for sale, cannot be redeemed in conjunction with any other offers, and no substitution by the Winner or cash alternative is offered. The Winner will be required to appear on the social media channels, blogs, and other promotional materials of Simply Asia. By accepting the Prize, the Winner consents to the use of his/her first name, social media handle(s) and image for promotional purposes after the Promotion and Prize Period, for which no fee will be payable. Simply Asia and Singapore Airlines reserve the right to void, cancel or suspend the Promotion where it becomes necessary (in their sole discretion) to do so or due to circumstances arising outside of their control. Simply Asia and Singapore Airlines reserve the right to refuse an entry and/or refuse to award the Prize if there is reasonable reason to believe that there has been a violation (or attempted violation) of these Terms and Conditions, the spirit of these Terms and Conditions, and/or applicable laws and regulations of South Africa. Simply Asia and Singapore Airlines reserves the right to modify or amend the Terms and Conditions (including the Prize) for this Promotion from time to time. Any changes will be posted on simplyasia.co.za/thainewyear website. Personal data supplied during the course of this Promotion may be used for Simply Asia communications and passed on to third party – Singapore Airlines to receive KrisFlyer and Singapore Airlines Group News and promotions. Insofar as is permitted by law, Simply Asia and Singapore Airlines will not in any circumstances be responsible or liable to compensate a participant or accept any liability (whether direct, indirect, special, incidental, exemplary, punitive or consequential) for any loss, damage, personal injury or death arising out of or in connection with any participant’s participation in the Promotion or taking up the Prize (or inability to take up the Prize), whether such liability arises from any claim based upon contract, warranty, tort (including negligence), strict liability or otherwise, and whether or not Simply Asia or not Singapore Airlines or their affiliates have been advised of the possibility of such loss, damage, personal injury or death. Your statutory rights are not affected. The invalidity or unenforceability of any provision, or part thereof, of these Terms and Conditions will not affect the validity or enforceability of any other provision or part thereof. In the event that any provision, or part thereof, of these Terms and Conditions is determined to be invalid or otherwise unenforceable or illegal, the other provisions, or parts thereof, will remain in effect and will be construed in accordance with their terms as if the invalid or illegal provision were not contained herein. Failure by Simply Asia and Singapore Airlines to enforce any term of these Terms and Conditions will not constitute a waiver of that term or any other provision of these Terms and Conditions. In the event there is a discrepancy or inconsistency between disclosures or other statements contained in the Promotion–related materials and these Terms and Conditions, these Terms and Conditions shall prevail, govern and control and the discrepancy will be resolved in the sole and absolute discretion of Simply Asia and Singapore Airlines. Any dispute, conflict or controversy, howsoever arising out of or broadly in connection with or relating to this Agreement, including but not limited to those relating to its validity, its construction or its enforceability, shall be first mandatorily submitted to settlement proceedings under the International Chamber of Commerce Amicable Dispute Resolution Rules (ICC ADR Rules). If the said dispute has not been settled within 60 days after a request for Amicable Dispute Resolution has been submitted under the said ICC ADR Rules, such dispute shall be exclusively and finally resolved by arbitration under the Rules of Arbitration of the International Chamber of Commerce (ICC Arbitration Rules). The ICC Rules’ Emergency Arbitrator provisions are excluded. The dispute shall be resolved by one arbitrator to be appointed in accordance with the ICC Rules. The place of arbitration shall be South Africa. The language of arbitration shall be English. All issues and questions concerning the construction, validity, interpretation and enforceability of these Terms and Conditions, or the rights and obligations of the participants and Simply Asia or Singapore Airlines or their affiliates in connection with the Promotion, Competition or the Prize (whether contractual or non-contractual), shall be governed by, and construed in accordance with the laws of the Republic of South Africa. Nothing in these Terms and Conditions is intended to, or must be understood to, unlawfully restrict, limit or avoid any rights or obligations, as the case may be, created for you, Simply Asia in terms of the applicable laws and regulations of the country in which you reside. The competition commences on 08 October 2018 and entries close on 28 November 2018. Customers may enter once a day throughout the duration of the campaign dates to try their chances of spinning the wheel and winning vouchers. Imagine winning a Simply Asia voucher to use in any of our stores in South Africa. The Promotion is open to individuals who are a legal resident of South Africa, aged 18 years or over, except employees of Simply Asia or affiliated companies. This includes spouses, life partner, parent, child, brother, sister, business partner or associate of any of the persons previously specified. The Terms and conditions agreed in this promotion is that Simply Asia may use your email address for future promotional communication. To be eligible to win, the participant must have entered their details on the website www.simplyasia.co.za/thainewyear and clicked on the button to spin the wheel. The participant may spin the Wheel every day for a chance to win i.e. You may spin the wheel every 24 hours. Customers may enter as many times during the campaign: 08 October – 28 November 2018. No further consideration will be required to Spin & Win. Simply Asia shall not be responsible for errors due to a force majeure event or technical fault including, but not limited to, technical malfunction, computer hardware or software failure, satellite, and network or server failure of any kind. Winners will be randomly selected on a daily basis; once the wheel has landed on a particular category, it will inform the participant if they have won and prize and in real time a voucher will be generated and emailed through to the customer. The voucher would need to be printed or displayed on your device when ordering at any Simply Asia for the staff to insert the voucher code into the till for the discount to happen automatically. Decisions regarding any aspect of the Promotion or Prize are final and binding and no correspondence will be entered into about it. Simply Asia will not be responsible for any typographical or other error in the administration of the Promotion, errors in processing entries, identifying the Prize Winner, in the announcement of the Winner or the delivery of the Prize. The vouchers are valid for 3 months from date of winning. If the Winner is unable to redeem the Prize for any reason, the Prize will be forfeited and the Winner will not be able to redeem any element of the Prize at a later date. Simply Asia will not be responsible or liable to compensate any individual in the event of forfeiture of the Prize. Simply Asia reserve the right to void, cancel or suspend the Promotion where it becomes necessary (in their sole discretion) to do so or due to circumstances arising outside of their control. Simply Asia reserve the right to refuse an entry and/or refuse to award the Prize if there is reasonable reason to believe that there has been a violation (or attempted violation) of these Terms and Conditions, the spirit of these Terms and Conditions, and/or applicable laws and regulations of South Africa. Simply Asia reserves the right to modify or amend the Terms and Conditions (including the Prize) for this Promotion from time to time. Any changes will be posted on simplyasia.co.za/thainewyear website. Insofar as is permitted by law, Simply Asia will not in any circumstances be responsible or liable to compensate a participant or accept any liability (whether direct, indirect, special, incidental, exemplary, punitive or consequential) for any loss, damage, personal injury or death arising out of or in connection with any participant’s participation in the Promotion or taking up the Prize (or inability to take up the Prize), whether such liability arises from any claim based upon contract, warranty, tort (including negligence), strict liability or otherwise, and whether or not Simply Asia or their affiliates have been advised of the possibility of such loss, damage, personal injury or death. Your statutory rights are not affected. The invalidity or unenforceability of any provision, or part thereof, of these Terms and Conditions will not affect the validity or enforceability of any other provision or part thereof. In the event that any provision, or part thereof, of these Terms and Conditions is determined to be invalid or otherwise unenforceable or illegal, the other provisions, or parts thereof, will remain in effect and will be construed in accordance with their terms as if the invalid or illegal provision were not contained herein. Failure by Simply Asia to enforce any term of these Terms and Conditions will not constitute a waiver of that term or any other provision of these Terms and Conditions. In the event there is a discrepancy or inconsistency between disclosures or other statements contained in the Promotion–related materials and these Terms and Conditions, these Terms and Conditions shall prevail, govern and control and the discrepancy will be resolved in the sole and absolute discretion of Simply Asia. All issues and questions concerning the construction, validity, interpretation and enforceability of these Terms and Conditions, or the rights and obligations of the participants and Simply Asia or their affiliates in connection with the Promotion, Competition or the Prize (whether contractual or non-contractual), shall be governed by, and construed in accordance with the laws of the Republic of South Africa.